Running out of power for your tablet or smartphone is a thing from the past when you have this Powerbag Deluxe Charging Backpack. This backpack has 6000 mAh battery build in that you can charge before you leave the house with the included AC cable. Now you can charge your mobile devices with ease. The backpack has USB mini, USB micro and a Apple 30 pins adapter wire going through the bag. So now you can charge your iPad, iPhone, Galaxy phone and table and much much more. And this Powerbag is not tiny either. Besides having room for you tablet and phone it also can hold a laptop, camera and more. 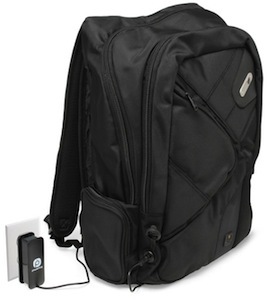 This backpack can hold a laptop up to 17″. Of course now you want to know how you know the charge of this bag. Simple press the button on the side and the battery bars will tell you how much charge you have left. Come and have a closer look at all the details of the Powerbag Deluxe Charging Backpack.